Flavored with chives, parsley, rosemary, and thyme, these elegant latkes also make a great starter course or brunch entrée. Fill a large mixing bowl three-quarters full with cold water. Using the coarse side of a box grater or a food processor fitted with a medium-coarse grating disk, grate potatoes, transferring them to the water as you go. Let potatoes stand in water 15 minutes. Pour potatoes into a fine-mesh colander and rinse well with water. Rinse mixing bowl and wipe dry. Take a large handful of potato and squeeze to remove some water. Pile onto a clean kitchen towel, gather towel corners up into one hand, and twist hard to wring out any remaining moisture. Repeat with rest of potatoes, using fresh towels if needed. Return mixture to bowl. In a medium bowl, stir together eggs, matzo meal, herbs, salt, and pepper, then pour over potatoes and toss to mix well. If at any time you notice a pool of liquid in the bottom of the bowl, toss in more matzo meal, 2 tbsp. at a time. Pour 3/4 in. oil into a 10- to 12-in. frying pan (with sides at least 2 in. high) over medium-high heat. When oil reaches 350°, scoop a scant 1/4 cup of potato mixture from bowl, then gently turn onto a wide spatula. Press into a patty about 1/3 in. thick, then gently slide pancake into hot oil. Cook 3 or 4 pancakes at a time (do not crowd pan) until edges are crispy and well browned and undersides are golden brown, 2 to 3 minutes. Gently turn and cook until other sides are golden brown, 2 to 3 minutes longer. Transfer pancakes to paper towels to drain briefly, then keep warm in a 200° oven while you cook remaining pancakes. 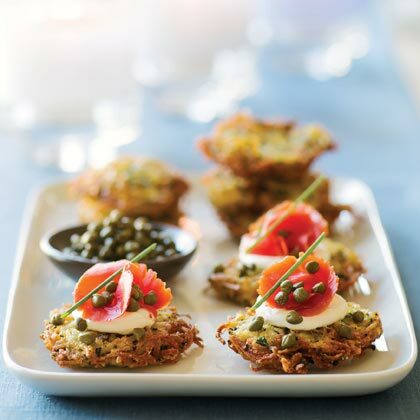 Serve with sliced smoked salmon, sour cream, onion and/or chives, and capers. Tips for Terrific Latkes: Soaking, rinsing, and drying the grated potatoes removes excess starch and makes the latkes crispy (not necessary for sweet potatoes). Use restraint when adding eggs and matzo meal. Too much will make the latkes heavy. Keep oil between 300° and 350° while frying to prevent latkes from turning greasy. Check heat with a candy thermometer and adjust heat accordingly. If making latkes ahead, let cool on paper towels, then arrange in a single layer in a zip-lock plastic bag and refrigerate up to 3 days. Reheat in a 300° oven until crispy and hot, about 15 minutes. Note: Nutritional analysis is per latke.